The idyllic life of Manhattan’s country estates was shattered by the American Revolution. The grand summer homes of the British officers were shuttered as their owners fought the rebellion. Others were taken over by American or British forces as temporary headquarters. And after the American victory, the estates of wealthy merchants who had sided with the British were confiscated. Henry Spingler was a successful merchant in the last quarter of the century. Born in Germany, he arrived in America in 1755 and married Miss Bonsall in 1780. Eight years later he would purchase the sprawling farmland north of the city in the area that would become Union Square. The article got the fact slightly wrong, if a bit more romantic in the telling. The first owner was, indeed, of Dutch descent. Elias Brevoort and his wife, Leah, sold the property to John Smith, “a leather dresser,” according to old documents, for 340 pounds. Upon his death, his executors sold the land on February 29, 1788 to “Henry Spinger of the city, shopkeeper,” for 950 pounds. The Spingers first lived in what was assumedly the house of John Smith. 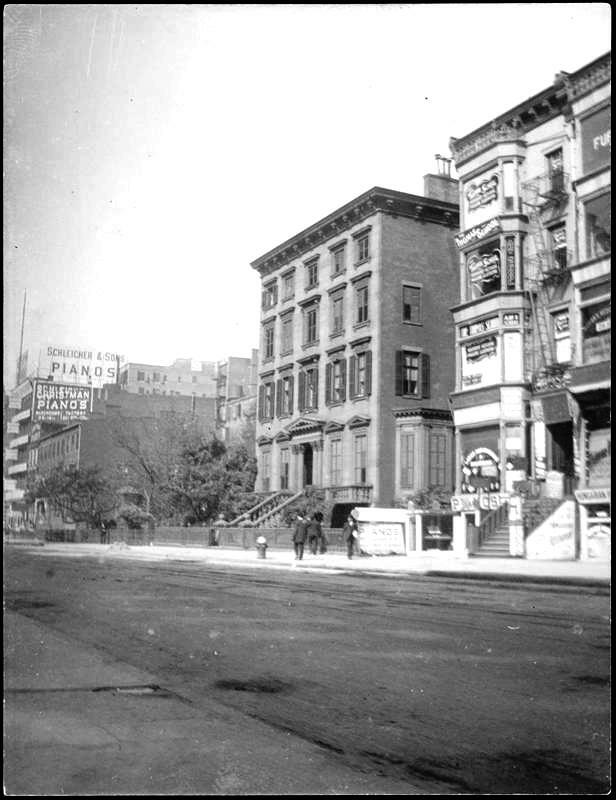 Over a century later The New York Times would say “The house was a quaintly built Dutch structure.” But according to the newspaper, he “soon found that it was lonely living down the lane from the Bowery Road. He therefore built a house on a hill in what is now part of Union Square, which house faced on the Bowery Road, or what is now Fourth Avenue.” Here Henry Spingler died in 1814. As the city crept northward the farms and estates were consumed. In 1832 creation of a new park, Union Square, was begun and by 1845 it was being ringed with the fine brick residences. That year $116,000 was spent on paving the surrounding streets and landscaping the square. The couple moved into a new house at No. 29 West 14th Street, in the center of the Spingler estate. While Van Buren (the name appears variously in documents and periodicals as Van Buren, Van Beuren and Vanburen throughout the 19th century) may have started as a mechanic, his management of the Spingler holdings was brilliant. The family’s fortune increased yearly. In 1845 Mary convinced her mother to leave the old Dutch farmhouse and erect a more suitable home. She constructed an imposing brownstone mansion at No. 21 West 14th Street, the next to her daughter’s. Four stories high over an exceptionally deep English basement, it stretched five bays wide. Stone balconies flanked the entrance and an iron fence protected the wide lot. The height of early Victorian taste, the doors and woodwork inside were done in rosewood. 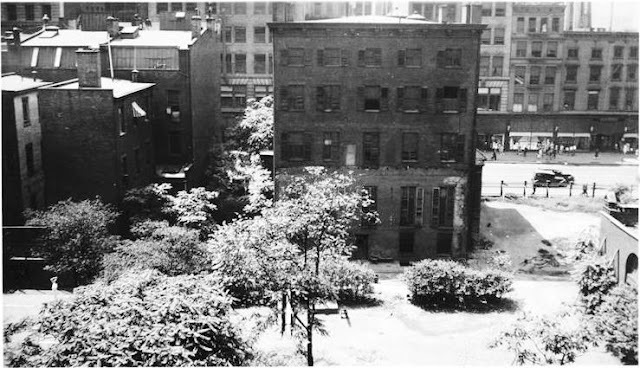 The houses were separated by a large garden that extended through the block to 15th Street. In the rear were the conservatory (essential to wealthy Victorian households to provide potted plants), the stable, arbors, dove cotes and remnants of the farm life—chicken coops and a cow or two. In front of No. 21 a poplar tree was planted at the curb where carriages would receive or drop off their passengers. By 1859 the Van Burens had moved into Mrs. Fonderden’s house. Michael Van Buren was now “Colonel Van Buren who commanded Ninth Regiment, formerly known as the 'City Guard. '” On October 14, 1859 the unit had its first regimental parade followed in the evening by a glittering reception in the Van Buren mansion. At the time one of the Van Buren’s staff was Charles Holmes, a coachman. On four occasions Michael Van Buren gave the man $20 to pay Bernard E. Gray of Bedford, Long Island, for hay. Holmes dutifully took the cash and the hay repeatedly appeared in the stable. Van Buren was rightfully embarrassed and enraged when Gray “personally applied to Mr. Van Buren for payment of his claim,” as reported in newspapers. The coachman soon discovered that pocketing what would amount to over $1,500 today was a mistake. He confessed to Detective Pool who arrested him that “he had squandered the money in the purchase of lottery tickets.” In March 1860 he was sent to prison. The Van Burens had two daughters, Mary Louis and Elizabeth Spingler Van Buren. Mary would marry attorney John W. Davis who assisted his father-in-law with the management of the estate. The house soon began filling with Davis children as two daughters and two twin sons came along. John W. Davis died in 1878. By now Manhattan’s wealthiest citizens were moving uptown along Fifth and Madison Avenues, erecting lavish palaces. The Van Burens and Davises would not join the trend. As the once-residential 14th Street neighborhood turned commercial, the family stood firm. Business and store buildings—all of which provided high rents to the family—replaced the old houses and surrounded what was familiarly known as the Van Buren Homestead. And, like the reclusive Hannah Goelet Gerry who lived alone in her old mansion at 19th Street and Broadway, a cow and a few chickens could be seen in the rear yard. In 1885 Riverside Park had been under development for nearly a decade. On September 8 young Louisa Vanburen Davis and her friend, Leila Berry, chose to take a ride to the park in Louisa’s victoria. The girls were described as “young ladies well known in society circles.” Plans for a pleasurable outing would turn into horror. Leila Berry panicked and jumped from the speeding vehicle. She landed hard on the pavement. Both Louisa and the coachman were unnerved. As the horse galloped across Broadway toward a pile of rocks, Louisa was either tossed from the carriage or jumped. The back wheel caught her dress and whirled her around, crashing her body to the pavement. Kearns was thrown from the carriage when it struck the curb with violent force. When Louisa married James B. Reynolds, they moved into the house next door to her mother at No. 29. They would have two sons, Frederick and Henry, and one daughter Sara. By 1893 both of the Davis sisters were widowed and the delightful homestead occupied by the two fabulously wealthy families was a conspicuous relic. The funeral was held in the mansion on August 11 and only relatives and immediate friends were present. “The services were simple and impressive,” reported The Times. “The body lay in the west drawing room of the old mansion and was surrounded by floral pieces. There were several great crosses and wreaths of white roses. A quartet from St. Mark’s furnished the music.” Outside a large crowd gathered on the sidewalk. A year and a half later, on January 28, 1896, the house hosted a more joyous event when the wedding reception of Louise Van Buren Davis to Alfred Huidekoper Bond of Boston took place here. But like so many of the later events in the venerable brownstone, it was understated and nearly private. Mary’s twin sons, Michael and John, “among the most popular clubmen in town,” remained in the house, along with their elderly aunt Elizabeth Spingler Van Buren. The newspaper mentioned that “One of the features of the old mansion is a poplar tree on the sidewalk, which was planted when the house was built, and which has given grateful shade in Summer to countless shoppers in this busy district.” Next door in the red brick house at No. 29, Louisa Reynolds and her unmarried daughter Sarah still lived on. John Davis told reporters that “The heirs of Mrs. Davis are few, and there is no need of splitting up the property for the purpose of reaching a settlement.” Davis was saying, in effect, that the family was vastly wealthy and did not need to liquidate the homestead. A few months after Mary’s death, 73-year old Elizabeth Van Buren went for a drive in Central Park. Returning home, her carriage was passing the Fifth Avenue Hotel when two women stepped into the path of the team of horses. Both women, Alice Trumbull and Grace Curtis, were knocked down and one was struck by a horse. Miss Van Buren’s driver, William Webb, pulled the carriage over and the wealthy dowager got out to see if the women were hurt. Although both assured the elderly woman that they were unharmed, she sent them home in a hansom cab. Later, still shaken, she sent her coachman to make sure they had arrived home safely. Finally, on July 21, 1908, the 79-year old Elizabeth Spingler Van Buren died in the family residence. “All her life Miss Van Beuren had lived in the old family mansion in Fourteenth Street,” said The New York Times. “In a district now given up to department stores, with the trolleys crashing by and the elevated railway within a few yards, it stood, an excellent example of the stately brownstone family homes of a century ago. Louisa Reynolds, still living in the brick house next door, was quick to squash ideas of development. “Mrs. Reynolds said yesterday that the Van Beuren homestead would still be kept intact, in spite of the death of her sister,” reported the Tribune. “Every old New Yorker had an affection for this house, and even newcomers to the city learned to love it. It was an agreeable break to the architectural monotony of down-town New York, like Trinity Church, standing on land worth a million dollars an acre and defying the land speculator and the real estate man,” said The Times. But the land speculator and the real estate man got his way, with little or no public outcry. Today a stretch of non-descript brick apartment building and retail stores lines 14th Street where a magnificent early Victorian mansion and a poplar tree stood for nearly a century. Fascinating, as usual! Thanks Tom. Henry Spingler and Col. Michael M. van Beuren.... It would be tedious of me to post the many corrections here. I love your blog. Keep up the fascinating work. I appreciate the focus you give on al your topics. PS: In general: Newspaper and magazine articles of the day, such as the NYT and McClure's, botched the facts. Historians end up being hampered by the crude generalities formed on the pages of their publications. In a 'fun fact': Jane's half-sister's daughter married John Jacob Astor, "America's 1st Millionaire". Astor and Spingler, both German immigrants, were contemporaries. 2) Henry had a 2nd house built, one that was not remotely located on the 22 acres as the 1st on was. While it was being built, Jane died. 3) Henry married Mary Bonsalll and moved into the new house with Mary. 4) They had one child, a daughter, Elizabeth (Eliza). 5) The City, as you say, condemned the new house and Mary Spingler (Bonsall), now a widow, moved into the old house with her Eliza who had married James Fonerden of Baltimore. 6) James and Eliza had one child = Mary, who married a poor working man the son of a discredited Loyalist family that had abandoned New York and were exiled to Nova Scotia, only to return to the NY area in 1790. This husband's name was Michael M. van Beuren whose fortune was made by virtue of this union. (So this was a family that relied on the wealth of Spingler, who was German, and his commercial connection to the English Bonsall family) ~> There is no connection to continuing Dutch, aka Knickerbocker, wealth. 8) Two more brownstones were built on part of the footprint of the original house (#1). ~ Not that any of this really changes the later story all that much.... Just thought someone might be interested to get the back-story in order. The van Beuren legacy lives on in The U. S. and Mexico. I am granddaughter of Mary Spingler van Beuren. There are cousins in Mexico City (Frederick van Beuren). Greetings Victoria: You and I are close cousins! The James Forrester House -- No. 202 Bleecker St.